These 7 Companies Are Killing It With their Email Marketing Campaigns! These days, checking your email as soon as you wake up takes precedence before anything else. If not upon waking up, you’re probably checking that inbox during your morning commute, or as soon as you sit on your work desk. The bottom line is, emails play such a big role in people’s lives nowadays, it is no surprise that companies utilize this to their advantage — in comes the concept of an email marketing campaign. We’ve all been there, right? We open our email’s inbox and suddenly we’re bombarded with newsletters and email updates. From there, we let out a little sigh and proceed to click on the ‘mark all as read’ button. Is it really possible to win at the email marketing campaign game? But believe or not, every once in a while some survive the purge. These 7 companies are praised left and right as these brands have some of the best email marketing campaigns out there! Ready to find out the secret for each of their successes? Read on! 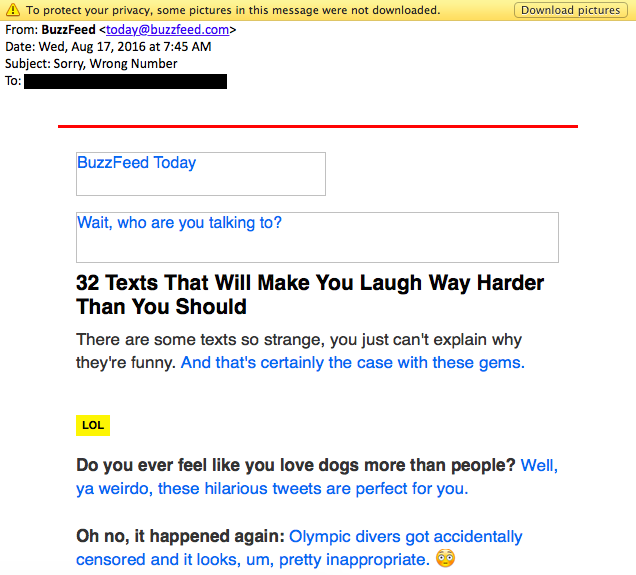 Buzzfeed is the textbook example of how eye-catching your subject line and preview text must be. Short, witty and straight to the point. Buzzfeed is a great reminder that to stand out, you must utilize subject lines well. But of course, it shouldn’t end there. It’s one thing to catch people’s attention, but another to get them to stay and read your content. Not only are people recognizing this company for their creative, engaging content, take a look at how they make use of the alt text of images. It just goes to show that as much as you should focus on the content of the email, you also need to take into consideration and pay special attention to small details such as an image’s alt text. Uber is known for the simplicity and consistency of their emails. Not only are they designed to give subscribers a clear call-to-action, but they also have clear copyrights every time, as well as sleek design work. Not only does Poncho give you daily customized weather updates, but their colorful, punny content is also one of the reasons why people are so drawn in to subscribe. Poncho is a great example of doing a lot, but not too much that it gets overwhelming for the one reading. The perfect utilization of the newsletter’s space, coupled with the pleasing to the eye kind of aesthetic is what we admire the most about them. 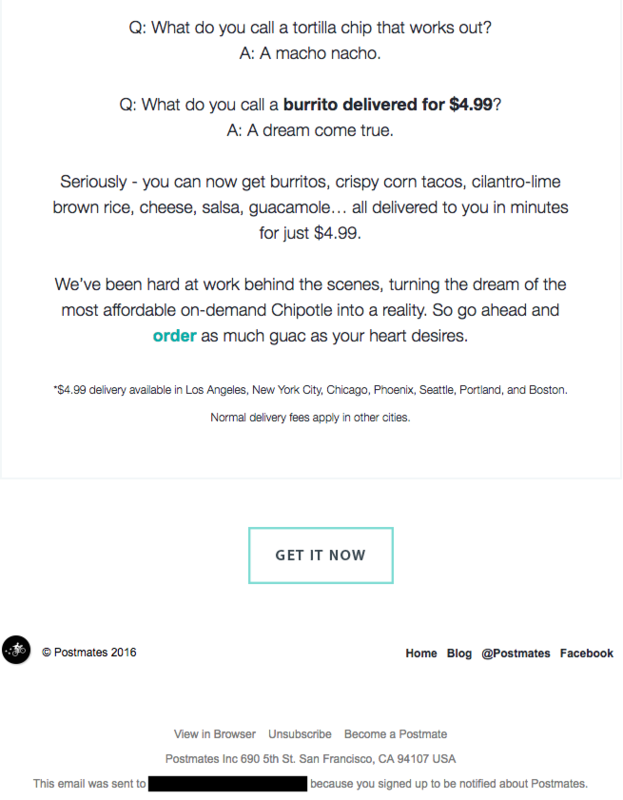 Similar to Poncho, Postmates uses tools such as high-quality GIFs to draw the readers’ attention. Notice how eye-catching their promo for a new product is. Not only that, their witty punchlines underneath will surely bring a smile to whoever is reading it. With that, don’t be afraid to play around with both written and virtual content — the more relatable you are, the more people will engage! AESOP: The Minimalist Aesthetic Is In, Too! Does your brand not fit the playful aesthetic? Well, worry not, there are other ways to bait your readers in! A good example of this is Aesop’s newsletter. There’s just something about this brand’s minimalistic approach that leaves us wanting more. Sometimes, simplicity is key — and Aesop shows us just how it’s done. With how busy one gets these days, we find it hard to stay on top of current affairs. 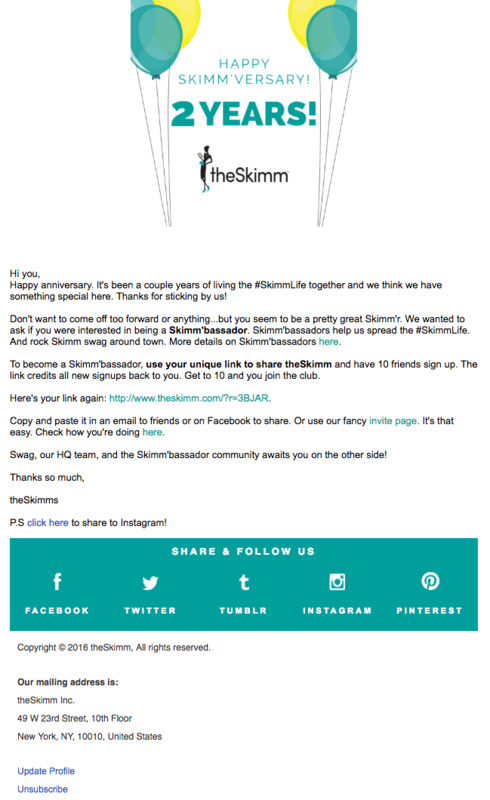 Thank goodness The Skimm is here to save the day, though! They put the NEWS in the newsletter for sure. If you’re one of these people who barely have time to watch the news or read a long article from news sources, then you should consider subscribing. Besides the fact that they sum up everything happening around the world so expertly within a 5-minute read, they do it with the right tinge of humor too. This brand also likes to celebrate subscriber milestones, such as how long they’ve been an active subscriber to their daily newsletters. This way, the personalization gives the reader a sense of belonging to a community. Most of us possibly have our very own charity of choice. These are the same institutions that you set aside money for every month, telling yourself that you’re doing well out there in the world. But have you ever, at one point, stopped to wonder where your money’s going exactly? This is what charity: water does best! They tell you in every detail where your hard-earned money goes, allowing room for transparency and trust between them and their patrons. So next time you think about making transactional emails, consider this example set by the organization. The way news and other offers reach us consumers nowadays is so different from before. All you need is an email address and you’d be pretty much connected to the rest of the world. This comes as both a blessing and a curse, especially in the realm of digital marketing. Being on the receiving ourselves, we know that most campaigns fall on deaf ears, so it is highly essential for marketers to try and avoid that. However, never be discouraged by the thought of falling into the graveyard of unread newsletters — instead, take those brands e mentioned as an example and you’ll surely be well on your way to email marketing campaign success!